New countertops can make a kitchen look very stylish and sleek. 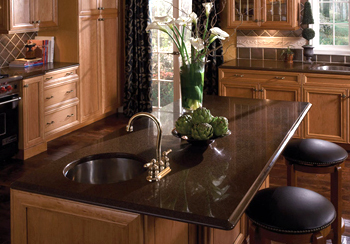 Countertops come in a variety of materials and colors. Whatever combination of color and material you’re looking for, our countertop specialists in Sterling, Virginia can help you through the choosing process. We’ve been in the countertop business for years and know all the little details that come only with time. Give us a call, or stop by our Sterling Virginia countertop showroom today, and we’ll walk you through your countertop selection and installation. A popular option today is Silestone. So what is Silestone you may be asking yourself? It’s a compound made from natural quartz. What is the advantage by using a compound made from natural quartz? This compound happens to be extraordinarily resilient and hard. Silestone is the only countertop made from quartz that has bacteriostatic capabilities that cannot be found elsewhere on the market. It is a hygienic material that helps keep your family healthier by reducing surface bacteria on your countertops, a common place for bacteria to reside. 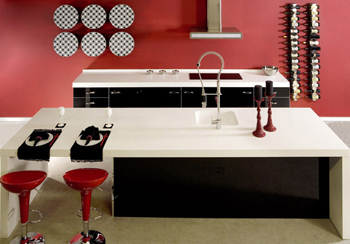 Silestone was originally offered in twelve varying colors twenty years ago, but now offers more than fifty. The colors and styles are designed to be pleasing to see while matching style trends. Silestone offers design options based on dimension, depth of color, and a myriad of color hues. Quartz is a naturally occurring mineral found in the Earth. It is actually the most common mineral on the Earth. It’s very advantageous to use quartz in countertops because it’s resistance to acids and it’s extreme hardness. Quartz is typically white but can be found in other colors if it comes into contact with impurities while it is being formed. Some other options are granite, marble, caesarstone, zodiaq, soapstone, slate, Corian, Wilsonart’s Gibraltar, Avonite, plastic laminate such as Formica, ceramic tile, wood, and concrete. Call or stop by Floors & Kitchen in Sterling Virginia to ask our countertop specialists about your options.